Anyone can attract bluebirds to their yard by following a few simple steps! If you have a large yard you can provide food, fresh water and possibly even nesting spots. If you only have a small garden or even just a patio, you can still put out feeders to attract these colorful birds to your space. Bluebirds prefer open spaces with multiple perches so they can look for insects from high vantage points. When they spot something tasty they will swoop down, grab their meal, then return to their perch. Providing them with open space to forage and plenty of perches is an excellent start to making your space Bluebird friendly. Adding a water source is another great way to attract them to your yard. Adding a dripper or fountain will give off the sound of running water but even a birdbath is a great addition. Bluebirds are cavity nesters, which means they will nest in cavities in trees or man-made birdhouses. Due to their small bill, they are not able to create their own tree cavities and therefore rely on other birds, such as woodpeckers, or man-made birdhouses for nesting. Competition for prime nesting spots can be fierce. 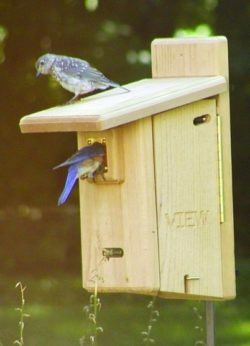 Other native species find bluebird nesting boxes appealing and with some non-native bird species that will also destroy the Bluebird’s nest or lay their eggs in with the Bluebird’s clutch. Due to this, Bluebird houses are designed with 1.5″ openings. This size prevents larger birds from entering the nest but the Bluebirds (and other smaller, native birds) fit just fine. However, over time, the opening of wooden nesting boxes may become enlarged so there are products to prevent that from happening or repair openings that have already been damaged. Once you have your nesting box, it should be placed near an open space where the birds can find plenty to eat. Males have been seen investigating nesting boxes as early as March because finding a good spot to nest is crucial. Females have been observed choosing mates based on their nesting spot above all else. If you put up a nesting box it is important to clean it out once a mating couple leaves for the year. Bluebirds generally won’t nest in a cavity that has an old nest in it or will take the time to clean it out themselves. Once a nesting spot and mate have been chosen, Bluebirds may have up to three broods in a summer. Sometimes juveniles from the previous brood will even hang around to help raise their younger siblings, providing even more Bluebirds to watch. 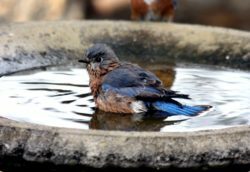 If you are lucky enough to have a resident Bluebird near your home they may act as helpful pest control, eating any insects they might spot in your lawn or flowerbeds. While their diet consists mostly of insects they will also eat berries, suet, and seeds. Even if you don’t have the habitat to support nesting birds, you can still attract them by putting out some of their favorite food: mealworms! While they will eat freeze-dried mealworms, live mealworms are much more tempting. These crawly little creatures can be purchased at Owenhouse West between (approximately) April and September each year – when the Bluebirds are likely to be in the area. Freeze-dried mealworms are available year-round. 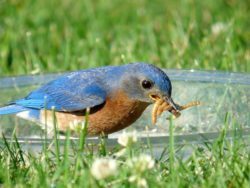 In keeping with the bluebirds habit of eating bugs off the ground, mealworms should be placed on the ground in a shallow tray to prevent them from crawling away. If you can’t leave the tray on the ground, that’s okay. Bluebirds will also eat from certain types of hanging feeders as long as they allow them to stand on a flat surface while eating. It may time some time for the birds to discover what you’re dishing up but once they know your yard has mealworms on the menu they’ll be back! Some birds will return year after year to the same feeding stations and, with patience, could even be trained to eat out of your hand. A small blue thrush, the male Mountain Bluebird adds a bit of color wherever it goes. With a lighter blue to white belly, and darker blues or greys on the wing tips the males are hard to mistake. Females and juveniles are much more understated, tending to be an overall brown-grey color with with similar lighter and darker areas, and touches of blue on the wings and tail. 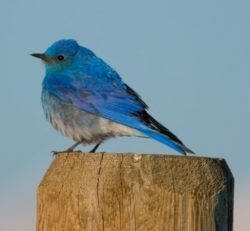 Mountain Bluebirds migrate to Montana each year to breed. Look for these birds in open areas near the edge of forests, along fence lines, or other places that provide abundant perches while still allowing the birds to forage for insects in the open. Aspen groves near forest openings are favorable as they provide an open feeding area and possible nesting cavities. Also migrating to Montana each year to breed, the Western Bluebird is slightly less blue but just as distinct as the Mountain Bluebird. The obvious difference is the rusty red chest patch that graces both males and females. Like the Mountain Bluebird, the Western Bluebird prefers open areas with plenty of perches so it can stand lookout until it spots its next meal. Swooping down to the ground to grab an insect is one of their signature moves and can be easy to spot the next time you’re birding in their prefered habitat. 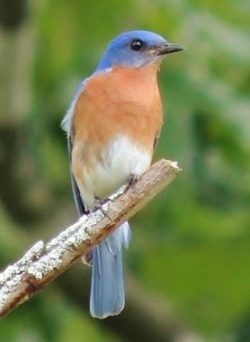 At first glance the Eastern Bluebird looks very similar to the Western Bluebird, but with one key difference. The rusty red chest patch extends all the way up to the bottom of the Eastern Bluebird’s bill, whereas the Western Bluebird’s stops at their neck line. Females are a grey-brown shade with similar, but often subdued, chest coloration. Like its name, the Eastern Bluebird tends to stay in the eastern part of the state although it has rarely been spotted further west. 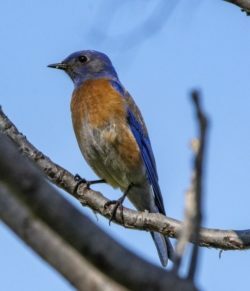 Unlike the Mountain and Western Bluebirds, these birds favor more open spaces and tend to spend more time on the ground foraging for insects.